ABS-CBN Corporation, the country’s leading media and entertainment company, bagged two Stevie Awards at the 2016 International Business Awards for its pioneering and game-changing digital terrestrial television product, ABS-CBN TVplus. 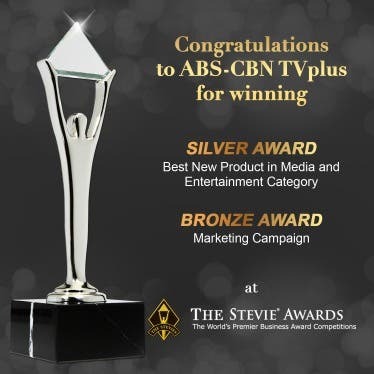 ABS-CBN TVplus won a Silver International Stevie Award for Best in New Product – Media and Entertainment Category and a Bronze International Stevie Award for Best in Marketing Campaign. The Stevie® Awards are the world’s premier business awards that honor the achievements and positive contributions of organizations and working professionals worldwide. ABS-CBN Corporation had previously won a Gold Stevie Award in the Company of the Year – Media and Entertainment category at the 2014 International Business Awards. “We take pride in being the first-to-market digital TV service that provides Filipino families relevant experiences of inspiration and innovation in their daily lives. This international award is a win for the Philippines and inspires us to continue innovating in the service of the Filipino,”says Chinky Alcedo, head of ABS-CBN Digital Terrestrial Television and ABS-CBN Mobile business units. ABS-CBN TVplus was commended for staying at the forefront of product innovation and marketing communication as it provided upgraded TV viewing experience and digital value-added services that go beyond television. “The various recognition given to ABS-CBN TVplus from international and local award-giving bodies is an affirmation of ABS-CBN’s efforts to equalize access and revolutionize television experience for the ordinary Filipino families,”Alcedo said. The award comes on the heels of ABS-CBN TVplus’ win at the 2016 Asia Pacific Stevie Awards in May where the product that offers clear picture and crisp sound won a Bronze Stevie for Best in New Product Innovation and a Bronze Stevie for Best in Branded Development. ABS-CBN TVplus is widely considered as the biggest innovation on Philippine TV for transforming the Filipinos’ TV viewing experience. It carries free-to-air channels such as ABS-CBN and ABS-CBN Sports +Action in full digital clarity and four premium channels including CineMo!, all-day movie channel, YeY!, all-day children’s entertainment channel, Knowledge Channel, which airs curriculum-based programs, and DZMM Teleradyo, the Philippines’ leading AM radio station on TV. ABS-CBN TVplus also offers the KBO (Kapamilya Box Office), a new prepaid pay-per-view service that showcases the latest movies, live events, teleserye marathons and specials. ABS-CBN TVplus previously won an Anvil Award and a Philippine Quill Award, which are two of the most prestigious communication award-giving bodies in the country. It also won Best Media Solution for Integrated Media at the 2016 Asia-Pacific Spark Awards for Media Excellence held in Singapore. ABS-CBN TVplus is available in Metro Manila, Rizal Cavite, Laguna, Bulacan, Pampanga, Nueva Ecija, Tarlac, Pangasinan, Benguet, and Metro Cebu. This year, this service has expanded to the key VisMin cities of Davao, Iloilo, Bacolod, and Cagayan de Oro. ABS-CBN is the first network to offer the Digital TV service in the Philippines after having invested heavily in infrastructure and test broadcast activities. 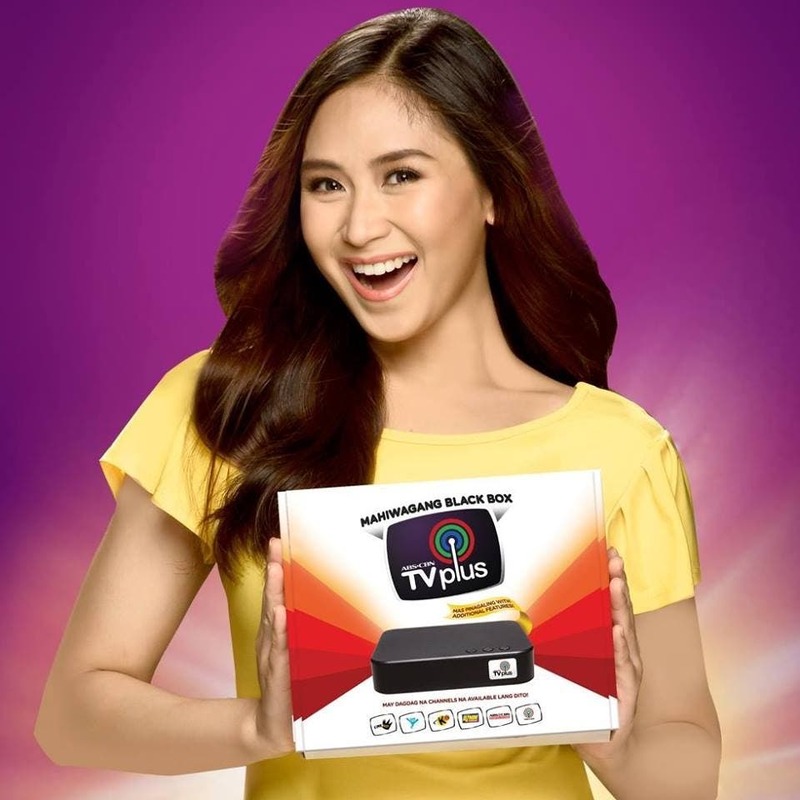 More popularly known as the ‘mahiwagang black box’, ABS-CBN TVplus was officially launched in February 2015 and has already distributed more than 1.8M TVplus boxes to date. HAHAHA, NI HINDI NGA NAPAGUUSAPAN NG SAMBAYANAN ANG ENCANTANGA, ROBINWHO AT ALDOGYOT NYO, WAHAHAHA.